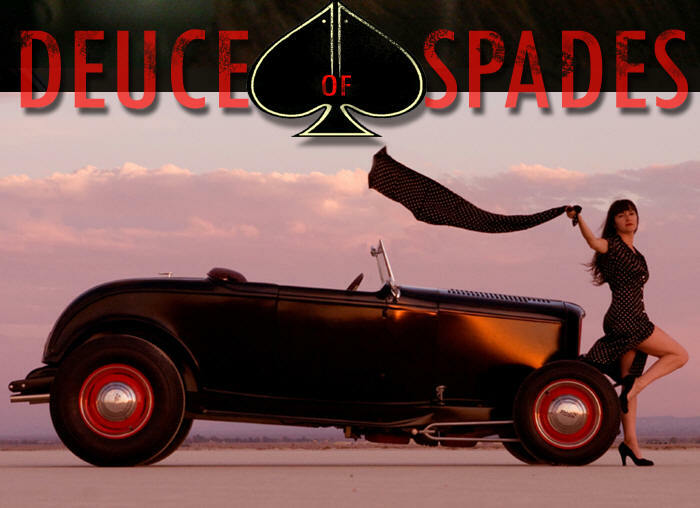 She owns a really cool vintage styled 32 hot rod herself and it’s the star of Deuce of Spades and more importantly… Damn! She’s good-lookin too! Faith wrapped-up the shooting of the painstakingly accurate 40 nostalgia scenes for the movie back in December. Don’t forget this is an independent film done almost entirely by Faith. Any major film company who can make period correct 1950 come alive deserves credit and this is practically a one woman show. Now, Faith is shooting the scenes when the movie’s back in present time. 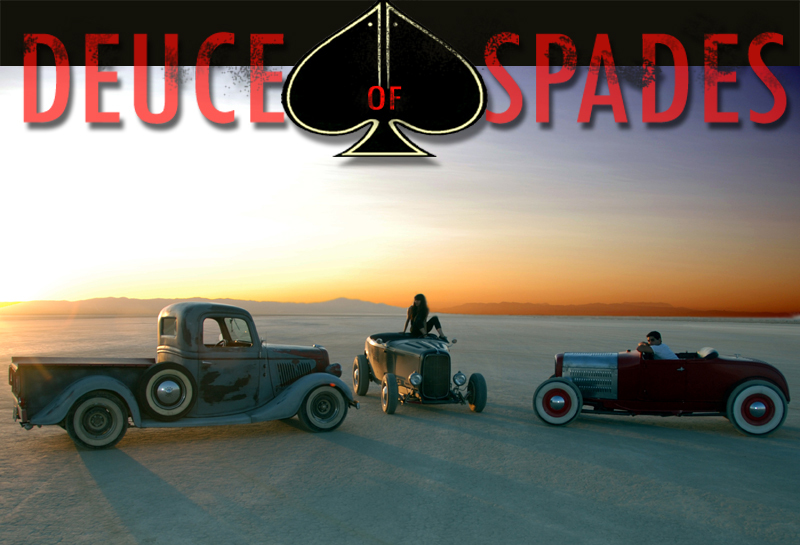 The first of the 2008 scenes featured hot rod and custom builder Gene Winfield as fictional character “El Mirage George”!! 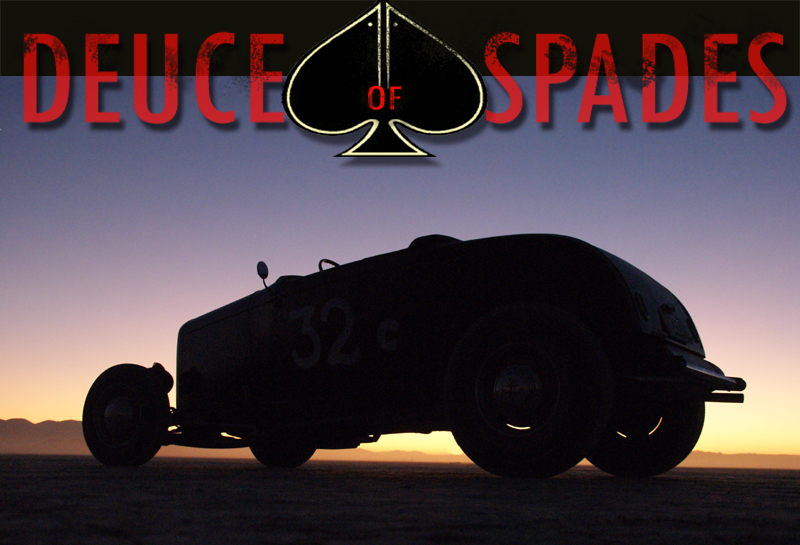 This was filmed live at the last SCTA meet and features quite a few cool race cars. Faith’s been whispering so many great things about what’s to come including a SoCal drive-in movie premier and hopefully a chance at other drive-in’s around the country. There’s no doubt that would be the perfect place to watch this movie. Until the films release (I’ll keep you posted!) here are a couple promo shots from the movie. Should I put these in the pinup section or what? We can’t wait Faith! Be sure to keep us posted! I wonder what cool cat turned you on to this movie??? Oh wait, I know….it was ME – your old buddy Rebar!!! This is gonna be such a cool movie. us up to date on whats going on. I can’t wait for the movie, either!!! She can always use donations to help her out. I’ve made a couple myself. 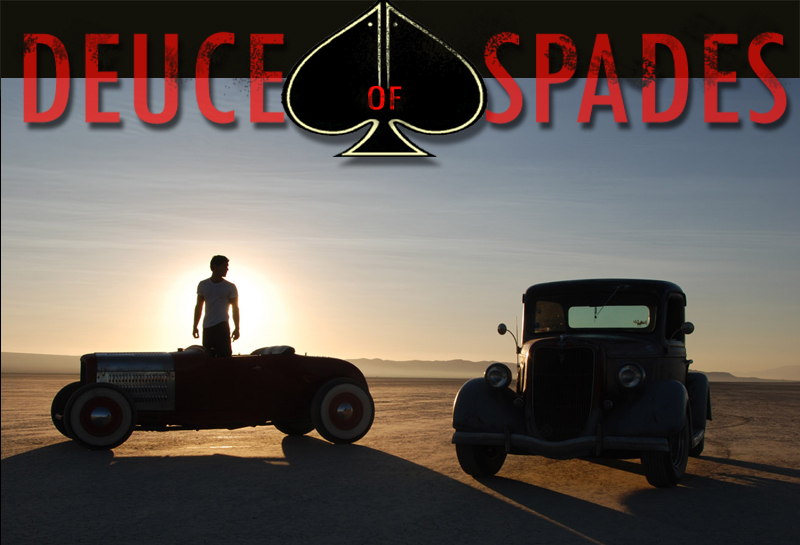 From everything I’ve seen and heard about this movie, it’s going to be an instant Hot Rod Cult Classic for sure. I too have made donations to this amazing effort. From what I read I know they could use our financial support to make it happen, especially with virtually no budget. Faith Granger and her filmmaking Team should receive a standing ovation for all the hard work and dedication they have put into creating this amazing film. I am very anxious to see and hear the completed movie. I’m certain it will ROCK!! 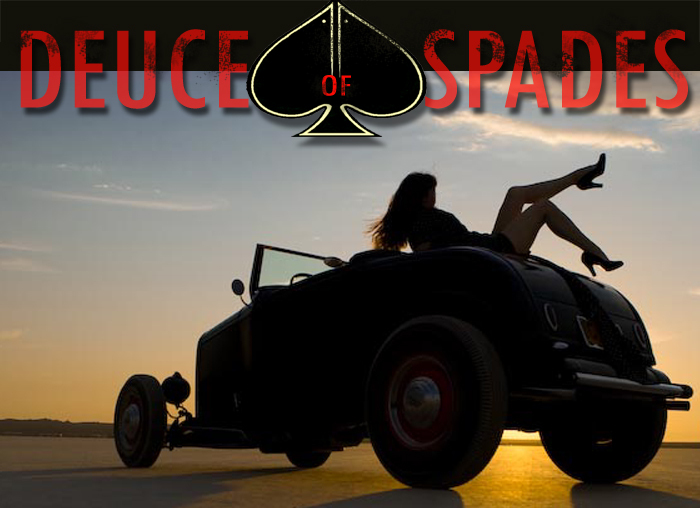 Here is the movie’s website I visit almost daily http://www.deuceofspadesmovie.com to get the latest info on the progress. 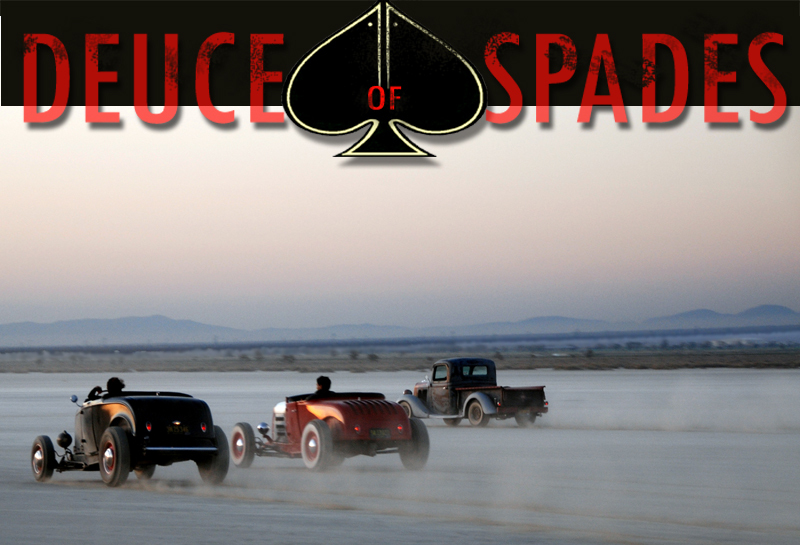 Hotrod movies are always welcome. 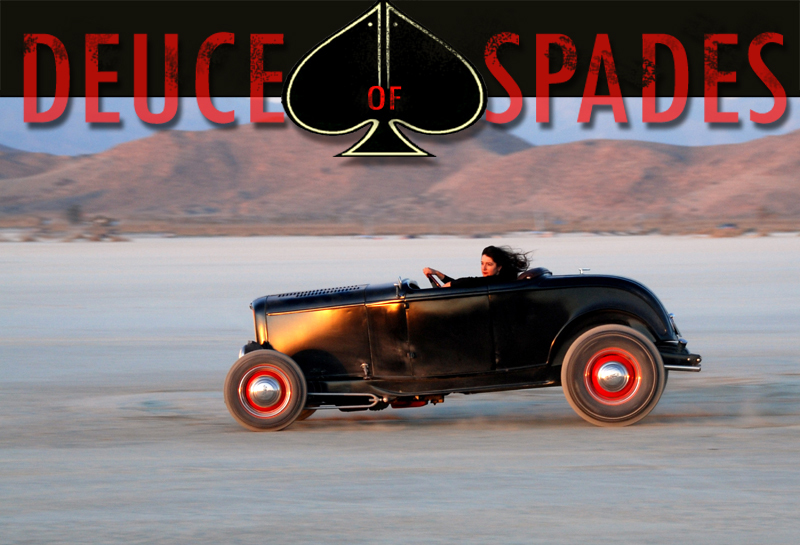 I have made an effort to collect old vintage hotrod movies, so I`ll be looking for this one. The wait is over! World Premiere is next Sunday (Nov 14th) in Fillmore, CA where some of the parts of the movie was filmed. There will also be a car show, live bands, swing dancers, old trains with dining cars: a real back to fifties event! I met Faith in Altoona; Iowa at Adventureland Campground the Summer of 2011. Have a copy of the Movie from her personally. What a talented; outspoken and wonderous lady. I could have spoken to her about old cars for hours, rather than the short minutes we spoke. 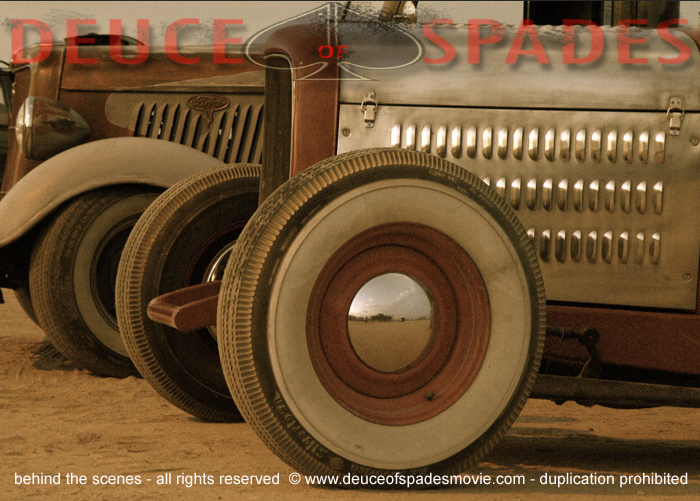 The old deuce reminded me of the my older brother had in the late 50’s. They took a rumble seated deuce with the flathead eight and turned it into a roadster, my Dad was so upset with him. My oldest brother had a 51 Ford coupe with a flathead 8 and three single strombergs, with overdrive stick. I am 60 yrs old now and remember my muscle cars; a 1969 Plymouth GTX 440 Magnum; Hemi-Cuda Auto. A 1973 LT-1 350 Z-28 to name 2 of about a dozen. When I was 15, I had a 1958 Buick Roadmaster Rag-top. A gal-catcher. I am pleased with the write-up in this blog and hope this movie becomes a #1. It brought back much de-ja-vu. A few tears and much joy. Thumbs-Up! Thanks for your comment Ed. Faith is truly one of a kind! I bought two DVD’s and really enjoyed the movie. This comment is late in coming, but Faith deserves high-fives mucho times. I wonder if she will allow me to show the disc at Top Notch drive-in located in Austin TX. Each first Saturday, the drive-in comes alive with rides from the entire region, and Austin has its fair share of cool cars, maybe the most in any single city in TX. These “hoodlums” keep the place rockin’. A very considerate, friendly bunch. Please let me know if I can share my DVD with the participants. There is no charge for anything but what you eat or drink.